The A3 Sportback e-tron is Audi’s premium plug-in hybrid offering, with a luxurious interior, high specification levels and potentially excellent economy it is a strong offering in the sparsely populated plug-in hybrid segment. It has received a mild update for 2017 which include additional safety and technology features as well as a refreshed exterior. Unlike much of the competition, the Sportback e-tron refrains from advertising its eco-friendly credentials on the outside and this is true of the interior too. Other than some extra buttons and gauges for the hybrid drivetrain, the dashboard, seating and upholstery is identical to the rest of the A3 range. Quality fit and finish is class-leading and the available virtual cockpit instrument cluster further adds to the premium feel inside. The A3 is not a big car and while occupants in the front are well-catered for in the head and legroom department, rear passengers may find it a bit more intimate. Head room is inadequate for taller adults and the lack of space extends into the cargo area which is also on the small side. Foldable rear seatbacks do offer greatly increased capacity and the battery pack is situated beneath the rear seats so it does not make for a shallower load area. The e-tron proves to be very capable down a twisty road, it masks its additional weight over a standard A3 well and the suspension’s ability to soak up pockmarked roads is commendable. Responses to the controls are immediate and the A3 e-tron flows down a road in a confidence-inspiring manner. Compared to rivals such as the Chevrolet Volt and Ford C-Max it is definitely the sporty choice in this segment.The cabin is well-insulated and eerily silent when driven in pure electric mode, the gas-engine not adding much more noise when chiming in. The Audi A3 e-tron is equipped with a 150 horsepower 1.4-litre turbocharged inline-4 that is allied to a 102 hp electric motor. Combined outputs are 204 hp and 258 lb ft of torque and drive sent to the front wheels through a 6-speed dual clutch automatic transmission.When working in tandem the gas and electric engines provide the A3 with class-leading performance. A 0-60 mph time of 7.6-seconds and strong in-gear acceleration thanks to the instant electric torque makes for fast and effortless progress. The 8.8-kWh battery pack allows for electric only driving for up to an estimated 16-miles and can either be recharged externally or by the gas engine. Overall consumption is rated at a very ambitious 83 mpg; this number is highly variable as hybrids tend to be far more efficient in city driving and less so on highways.Gas-hybrid mode yields a more realistic 34 mpg although with judicious use of the throttle and the selectable driving modes this figure can be greatly improved upon. 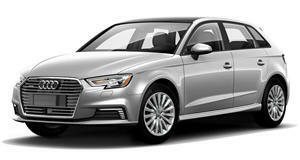 The A3 e-tron carries a premium price tag and offers premium specification levels too. Perhaps unsurprisingly the first two trim levels are named Premium and Premium Plus. The base Premium trim has a comprehensive list of standard features such as full leather upholstery, power front seats, panoramic sunroof, keyless ignition, automatic climate control, 5.3-inch display with Bluetooth and rearview camera. Safety is taken care of by a Audi pre sense basic and front which include a forward collision mitigation system and automated emergency braking. Premium Plus trim adds LED head and taillights, heated front seats, parking system plus with rear camera, auto-dimming rearview mirror and updated trim details.The top Prestige trim adds the Audi virtual cockpit, B&O 14-speaker sound system, adaptive cruise control and smartphone interface and navigation system.Individual options can be added depending on trim level and a Sport Package offers 18-inch wheels and sports seats to all trim levels. The Audi A3 Sportback e-tron is a plug-in hybrid positioned at the premium end of the market offering a unique blend of performance, economy and luxury. Cramped rear seating and limited EV range as well as a high price tag may ensure that it stays a niche offering in this segment.